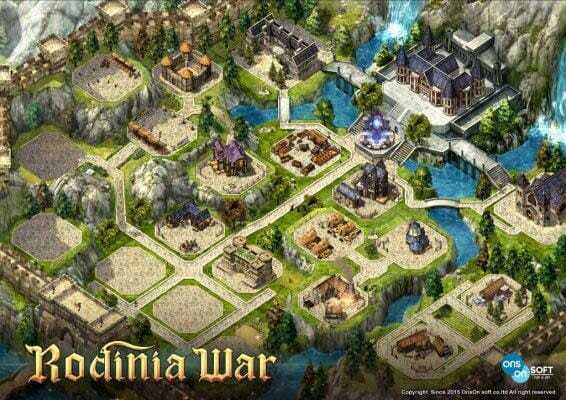 Rodinia War is a Korean fantasy-themed online game with a mix of city-building strategy gameplay (like Clash of Kings, Tribal Wars, and Grepolis), and a classical MMORPG gameplay (like Echo of Soul, and Archlord 2). It is currently being developed and published by Ons On Soft, a developer known from their Fiesta Online MMORPG. Rodinia War is currently in its 2nd closed beta testing. If you like city-building strategy game wherein you can waste time upgrade your city, and invading others, then Rodinia War has that side, in fact, it is already solid and playable. Though it lacks some features that I will discuss later. Visually speaking, the city actually feels alive, there are people and animals walking, there are birds, and the clouds, too. It is never boring to look at since everything is moving. There are 4 types of resources that you have to look up for, wood, iron, stone and food, these are essential for upgrading your buildings, and you can get them through the buildings like the quarry, farm, mine, and lumber camp. They are automatically gathered every hour, so you don’t have to worry about that much, however, you need to upgrade them to give more. These resources are needed to build troops and infrastructure in your city. As you can see on the screenshot above, the city is pretty huge and you can build several buildings into it, though you may not be able to build all (which is a bummer). All of the buildings are essential to each other. Upgrading building does not take a lot of time either, and most of the time, you will be running out of resources before the building gets upgraded. There are two special buildings that you need to check out. Lord Hall and Knight Mansion, the former is basically important because this is where you can get conquer flags to capture other territories. While the latter is where you can hire knights to play on Knight Mode or to defend the city. Pretty neat stuff, I must say. There are 4 maps in Rodinia War, specifically North, East, South, and West. Each has its own Area map. There are several cities that can be found here in which you can attack and ransack, there are also rebel territories which occupies several spaces. This would have been great if there are many active players, but sadly, there are only a few ones, and everything else is a dead city. You can attack, defend, or ship goods on other cities, but that does not make sense for now as there is no alliance feature, so basically, everyone is your enemy. An Alliance would be much needed in this game, but that may come on later updates. Right now, every city is your enemy. The MMORPG Gameplay of Rodinia War sadly fell on mediocrity, and you are neglected of character creation since like I previously mentioned, you hire knights then use them to play this side of Rodinia War. Currently, there are 5 classes to be played with, these are Archer, Warrior, Fighter, Wizard, and Assassin, each of them has a unique set of skills. Sadly, you cannot choose what to use as the system randomly picks the knight you can hire, so it may take a while to see and get what you want. There is no customization regarding the physical appearance to make them unique, and even for the stats, you cannot increase stats in the game, it all depends on what you wear mainly. You can, however, level up your skills, but then again, there are only a few skills available and you can easily unlock all of them. You can use a keyboard or mouse to move your character, but the controls are so frustratingly clumsy, and add the frustrating notion that you have to manually move your knight to the location just for him to loot the dead enemy, or to do the quest, and you also have to manually spin your knight so he can look in front of the enemy before attacking him. It is bothersome to do and is a chore. There is no fun in that, and it should really be fixed. Lastly, do not bother with the pathfinding, you have to micromanage your knight all the way to the quest because he is going to get stuck easily. The visuals look generic and everything, most areas are meh, but the city/castle looks decent enough. Monster designs are pretty common, but some actually look original. Overall, it looks and feels like any other Korean MMORPG. Both gameplays barely have background music, and that degrades the immersion even more. The ambiance is so dull, though, at some point on the MMORPG part, there is music playing, then suddenly fading slowly away, that is just stupid. It needs background music and better atmosphere, to be honest. The quest system serves both gameplays alternatively which is a good thing, so you are not necessarily forced to stay in one part of the game. The rewards are always for your resources, but is it rewarding? Well, not really. As it usually gives up an average of 135 resources every quest, and sometimes even 50. It’s outrageously low to be honest, though you can easily finish a quest within 15 minutes, it just does not feel right. There are side quests within each area of the map, so you are not restricted to do the main quest, which is actually nice. The quest should be more rewarding than this though. – City-building Strategy Gameplay is already good, and playable. – The graphics look decent in the city. – A huge map to conquer. – Building Upgrade Queues are quick. – Can hire knights (heroes) to defend your city. – Can conquer other lands. – Quests Rewards are specifically for the City’s resources. – 5 classes with unique skills and abilities. – Some monsters look decent and original. – Few skills to be unlocked. Rodinia War is still in its closed beta testing, so there are a lot of cons and hopefully, they get fixed. The city building strategy gameplay is definitely good as of now, just needs tweaking and more features. On the other hand, the 3D MMORPG gameplay needs a lot of ironing, especially with its main features. Would I recommend it? Well, no, not really, this game needs a lot more to give out fun factor to players and to keep them playing. But if you insist on playing, just do not expect extravagantly and you would be fine.